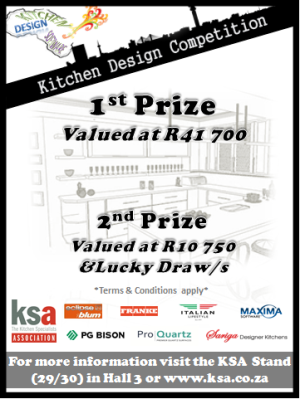 The KSA together with Competition partners: Inspire Trade Expo, Eclipse Furniture Fittings, Franke, Italian Life Style, Maxima Software, PG Bison, ProQuartz and Sariga Designer Kitchens bring you a 2014 Kitchen Design Competition. Send your design using the predefined room layout to comp@ksa.co.za before the 18th July to stand a chance to win magnificent prizes. 1. Name, contact number , email address & company details must be visible and legible on your entry / design. 2. The KSA , partners & members may use your contact details when deemed necessary to send you industry related information & invitations. 3. This promotional competition is conducted by the Kitchen Specialists Association (KSA) and Competition Partners - “the Organisers” - and is open to persons over the age of 18 in the republic of South Africa. 4. By entering this competition all participants and winners agree to be bound by these rules. In the event of a dispute the Organisers decision is final and binding. 5. Contestant entries will be evaluated by a panel of judges from various disciplines within the KSA. 7. Participants may only submit ONE entry and may not win more than one prize. 8. Each kitchen must feature one or more of the sponsors products. 9. Only designs that meet the brief will be considered. 10. All Designs must be in a CAD (Computer Aided Design), both the plan and rendered view must be submitted. 11. Entries that do not meet the criteria will be disqualified. -	By Email - comp@ksa.co.za , emails must not be bigger than 5MB. -	By appointment at the KSA offices (with Maxima Software) 14th July to 18th July. 13. Competition Opens 7 July 2014. 14. Competition closes 18 July 2014, no late entries will be considered. 15. The judges decision is final. Winners will be notified telephonically or by email by the organisers. 16. The KSA has the right to use all designs/ pictures submitted as part of the competition in future marketing. 17. The KSA has the right to use a photograph of any entrant and mention their name in any marketing. 18. Delivery of prizes is to be arranged with sponsors, however is limited to Gauteng area only. Collection can be arranged by the winner if preferable. 19. All participants and winners indemnify the organisers, their advertising agents, advisors, nominated agents & suppliers, their affiliate or associated companies against any and all claims arising, howsoever (including willful misconduct or negligent act or omission) from their participation in any way howsoever in this competition. 20. Winner’s names will be available on request. 21. Prizes are not transferrable and cannot be exchanged for cash or an alternate product.